it.x-press optimally maps handling from start to finish. Furthermore, the solution allows businesses to digitally connect with CEP service providers (courier, express, and parcel) and forwarding companies – resulting in complete transparency. More than 80 transport CEP service providers and forwarding companies are integrated into it.x-press. Is it quite complicated for you to calculate your logistics costs accurately? If you are searching for answers to one or more of these questions, just contact our experts and learn about our solution it.x-press. With it.x-press you get the all-round package that meets all your shipping needs. it.x-press simply integrates all ongoing business processes into your existing SAP system. This eliminates the requirement for service provider-specific or in-house software. You can manage numerous shipping tasks from a single, centralized system. Not only does this give you more time to focus on your core business, it frees up resources and subsequently reduces operating costs. Track and monitor the handling process from start to finish. Benefit from features, including customizable shipping options for each service provider, label printing, printing of manifest lists, data conversion, transmission, and shipment tracking. All of this enables you to know the status of any order, so that nothing gets lost. it.x-press is continuously supported by itelligence. Updates are applied when necessary, so that your practices and standards remain up-to-date at all times. Clear mapping of the entire shipping process and document generation means you have peace of mind when it comes to complying with legal standards. Furthermore, the modular design allows you to make changes to your system to suit the needs of your business. Our integration solution, it.x-press, establishes a direct connection to all of your transport service providers. Expensive service provider-specific or in-house software are now things of the past. it.x-press thus helps you save precious time and money. Our turnover has grown by almost 10%, but we are handling it with the same staff resources, and we have simultaneously reduced our overtime. For over 25 years, itelligence has worked closely with organizations from all industries to streamline and optimize key business processes. Having built up expertise in the logistics sector, itelligence is the perfect partner to help you ensure that orders and deliveries run smoothly every time. 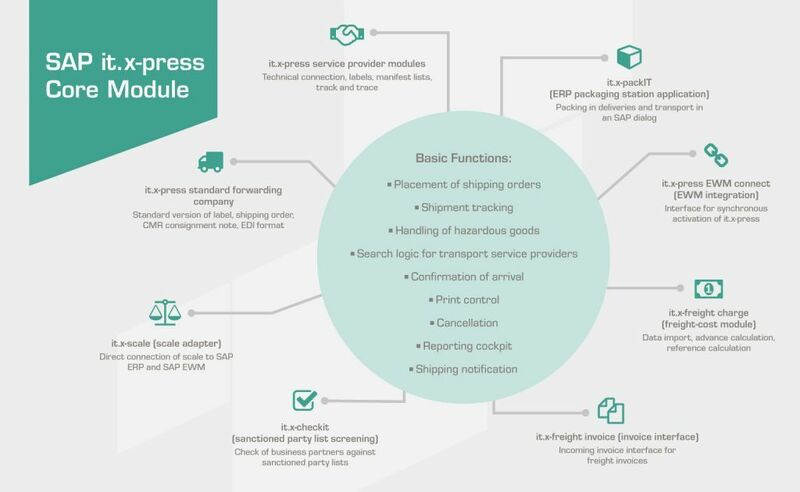 The wide variety of functionalities that it.x-press offers enable companies to tailor logistics processes to their needs and ensure reliable as well as time- and cost-effective operation. Are you searching for answers or would like to receive more information on it.x-press? Do you want more detailed advice from our expert or wish to book one of our it.x-press workshops?